As presented in the previous episode, the main concern of the board of directors is to show the clear direction towards which the company must go in the future, namely to establish the company’s productivity vision (or whatever the company wants to be). The senior managers must be constantly concerned with developing the company’s productivity mission (or why the company even exists and what real production capacity it has to ensure), establish the business principles on which to develop the company’s values and establish productivity core business goals in the short, medium and long term and profitability and productivity scenarios and strategies to meet the vision set out by the board of directors. Then middle managers and lower managers should lay down in detail the profitability and productivity strategies and policies (targets and means) in order to fulfill the vision by continuously fulfilling the productivity core business goals. a creativity and involvement of all people within and outside the company to continuously support culture to improve productivity (including quality). The figure below shows Productivity Business Model (PBM) – the basic framework for the development of the MCPD system. As you can see, after defining the Vision and the Mission of Productivity (a topic approached in the previous episode), Productivity Core Business Goals (PCBG) (III), Profitability and Productivity Scenarios (IV) and Profitability and Productivity Strategies (V) are addressed (the three topics of this episode). 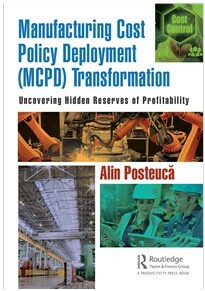 Detailing the productivity mission, in conditions of overcapacity, undercapacity or undercapacity with a hidden overcapacity, is done through the establishment of productivity core business goals (PCBG) in dynamics for the next 3-5 years, based on previous results, to perform quantitative and profit vision. So by PCBG the answer to the question is looked for: How to perform the productivity mission in terms of sales volumes increase or decrease? 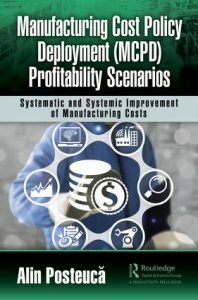 Manufacturing profit increase involves establishing the multiannual dynamics of annual contributions to external manufacturing profit obtained from goods sales and internal manufacturing profit from MCI by improving losses related costs (continuous improvement of current capacities; especially equipment) and waste (continuous improvement of stock levels, especially of work in process – WIP). Starting from declaring the vision of productivity, where a group is working under the guidance of the opinion leaders in the company (the board of directors), namely starting from where the company sees itself in the future (5-10 years) from the productivity mission statement of the company to fulfill its vision under the guidance of senior managers, from PCBG and implicitly, from the prioritization of major courses of action to meet the company vision of productivity, multiannual productivity scenarious develop depending on the state of expected sales growth (undercapacity) or drop in sales (overcapacity). Therefore, the need for a long-term profitability and productivity strategy is regardless of the internal environment and especially outside the company, especially for thestates of overcapacity or undercapacity with a hidden overcapacity, which are the most common. Therefore, the monthly central question of middle managers on profitability and productivity strategies is: How to meet PCBG? The big challenge of this question is keeping the interest for productivity continuous improvement for everyone in the company, especially for middle managers, lower managers, team leaders and the operators. In order to keep this constant care for productivity, PBM addresses productivity strategies at three interrelated levels. 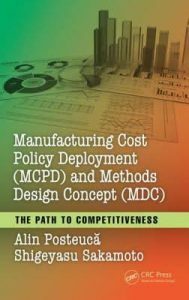 ensure an acceptable level of efficiency to achieve the annual and multiannual manufacturing target cost (by minimize inputs; reduce excess amount of input – waste improvement). reducing the delivery lead time. The expected impact concerns the development and then the implementation of objectives, scenarios, strategies and policy (targets and means) of profitability and productivity in a clear and acceptable way by the company and beyond. Based on the objectives and policies, a master plan is developed for implementing the actions and activities needed to achieve the outputs level of performance required to continuously satisfy the corporate vision. In the design, implementation and verification of results of the actions and activities of the productivity master plan all employees are involved: senior managers, middle managers, lower managers and implementation teams of improvements and problem solving that include team leaders and operators. These latter topics will be addressed in the next episode of our MCPD tutorial.